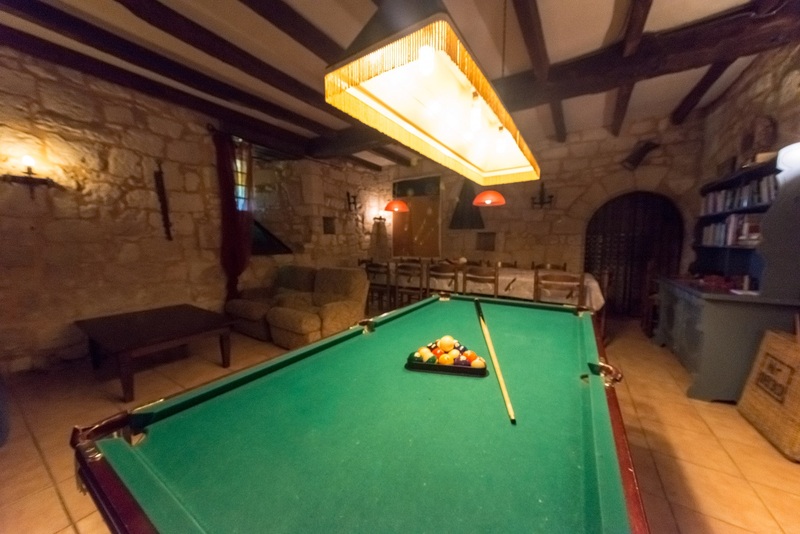 Accommodation for up to 15 guests, Château de Sadillac offers an exclusive holiday accommodation, the château with its private golf course, pool and sauna are there just for you and your friends and family. Exclusive use of the accommodation and facilities, like the golf course with its attractive 9 hole 27 par approach, beautiful pool, fishing lake, trampoline, huge chess game, children’s play corner, table football, wood-fired pizza/bread oven, barbecue etc etc. 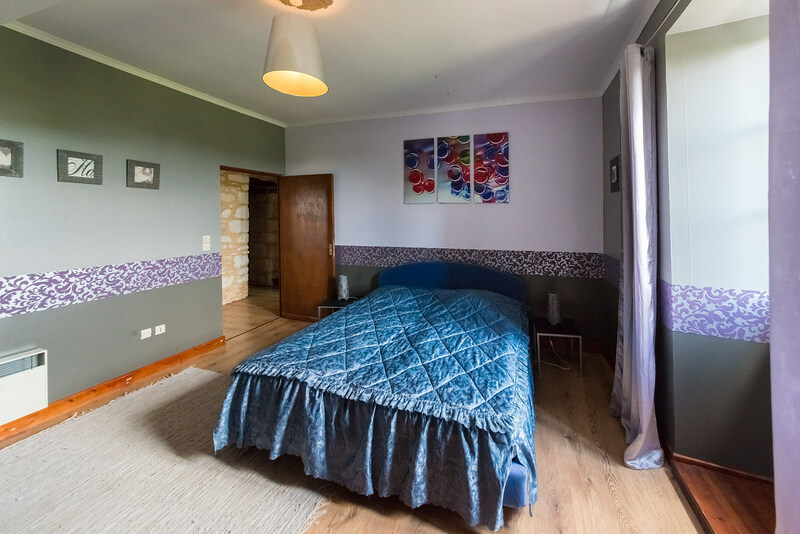 There are 6 luxury bedrooms, 3 en-suite and 3 shares one big bathroom, huge living room with wood burner, comfortable couch, television, DVD. Huge kitchen, fully equipped with an oven, gas cooker, microwave, toaster, coffee machine, fridge, freezer, washing machine and dishwasher. There is a bar, with an extra fridge and entrance to the huge terrace with awning, overlooking the golf course. Through the bar, you can also enter the spacious second sitting/dining area on the ground floor. On the terrace you can find a children’s play-corner, table tennis, life-size chess, the entrance to the pool complex, in the pool complex you can find a South facing “heated” pool (12*6 meters) with a roman end and wooden decking, surrounded by a laurel hedge for privacy, a Finnish sauna, an extra toilet, shower and changing room. 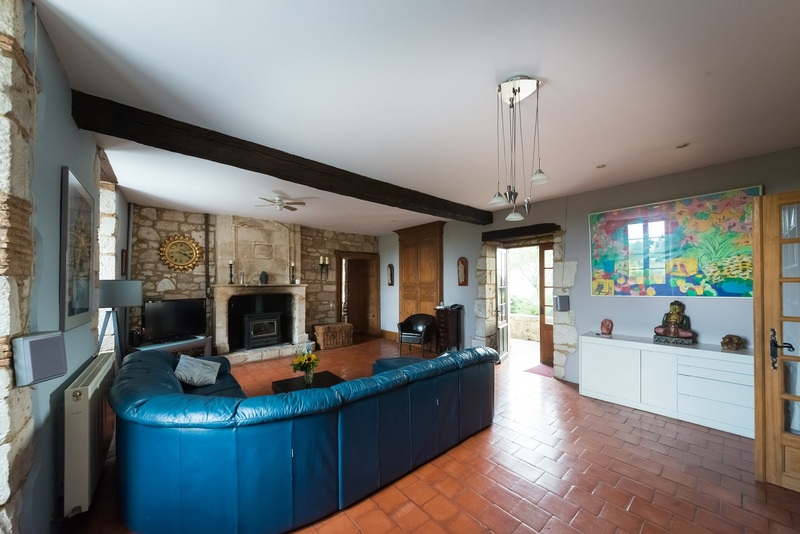 Also for our clients: Barbecue, Pizza/Bread wood oven, Golf equipment for children and adults, Free WIFI Broadband, high chairs and proper cots. 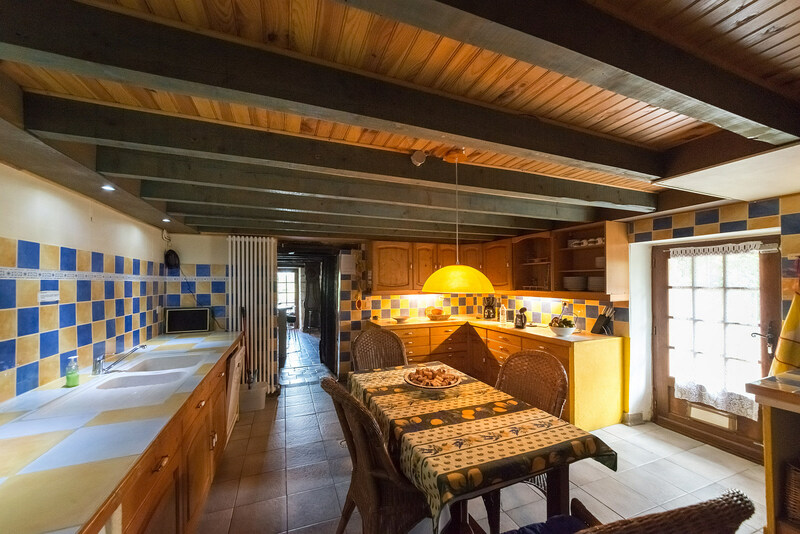 Next to the kitchen and dining room but close to the terrace your bar, with an extra fridge and bar stools. On the second floor, overlooking the golf-course, 4 5 and 6 more or less identical rooms with a double bed (1.80*2.00 m) and wash basins. These rooms are sharing a huge bathroom with a rain shower, also there is a separate toilet for these rooms. Spacious living area with dining table for 15 people, 2 couches, 2 chairs, nice area to relax in when it is hot outdoors. The bar is only a few meters away for your refreshments. 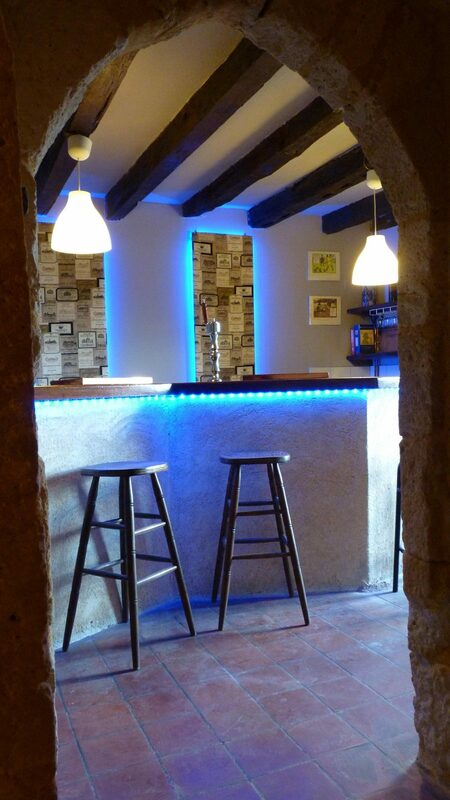 In the bar you find a fridge and enough space to store your drinks, a nice area for a cold beer or an aperitif. On the second floor overlooking the golf-course and the court-yard it is the largest room. 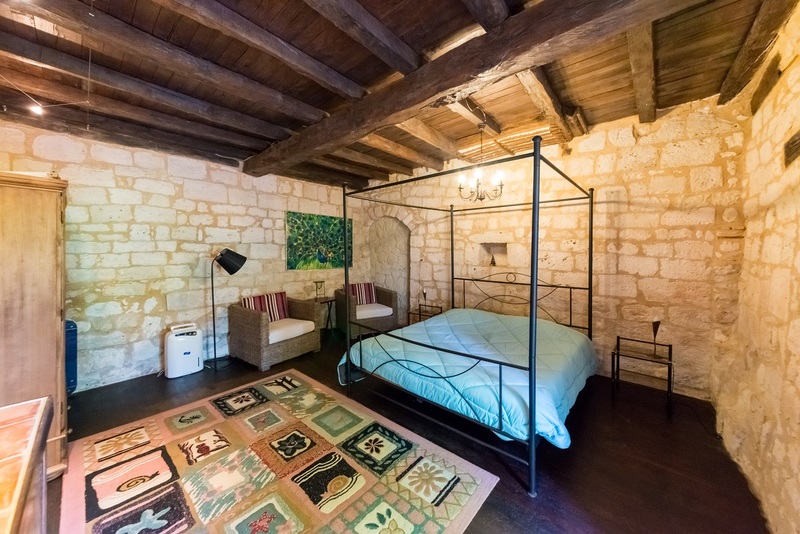 Furnished with a huge four-poster bed ( 180 x 210 cm ), a cosy nook and adjoining bathroom in the tower with a shower, wash basin and toilet. 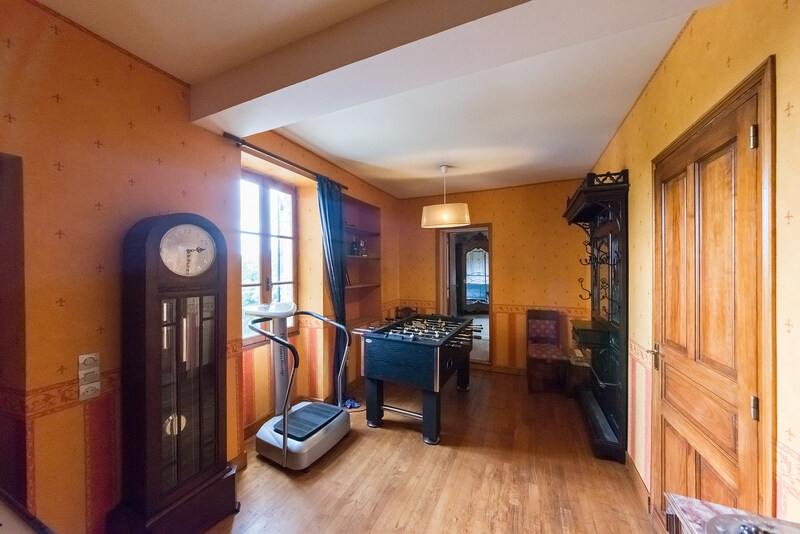 On the mezzanine floor is an antique French bed (1.10*1.90 m) for an adult or a child. The huge kitchen is fully equipped with dishwasher machine, fridge, freezer, coffee machine, toaster, gas cooker, oven, microwave, blender. 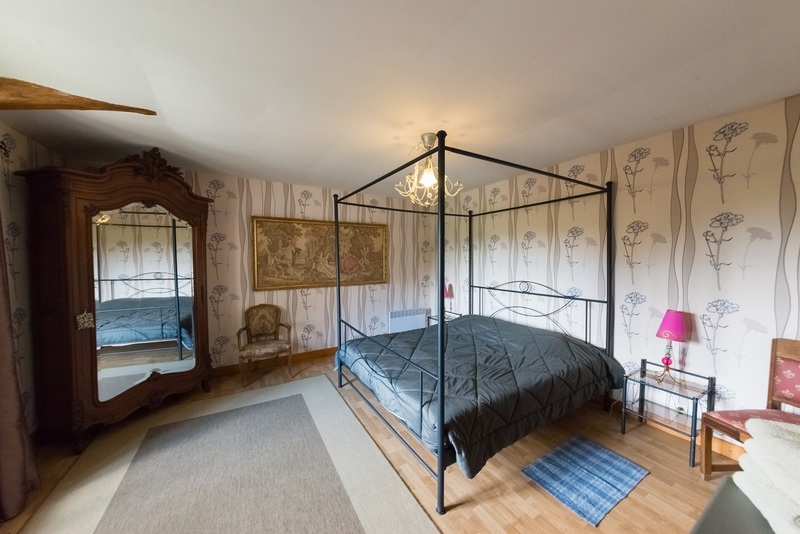 On the first floor overlooking the court-yard, spacious room with a four poster bed (1.80*2.00 m), a seat and adjoining bathroom with bath/shower, washbasin and toilet. Beautiful room, delightfully decorated and breath taking views to breathtaking and entrance gate. There is a wood burner for the chilly evenings, television, dvd player, books and huge couch. 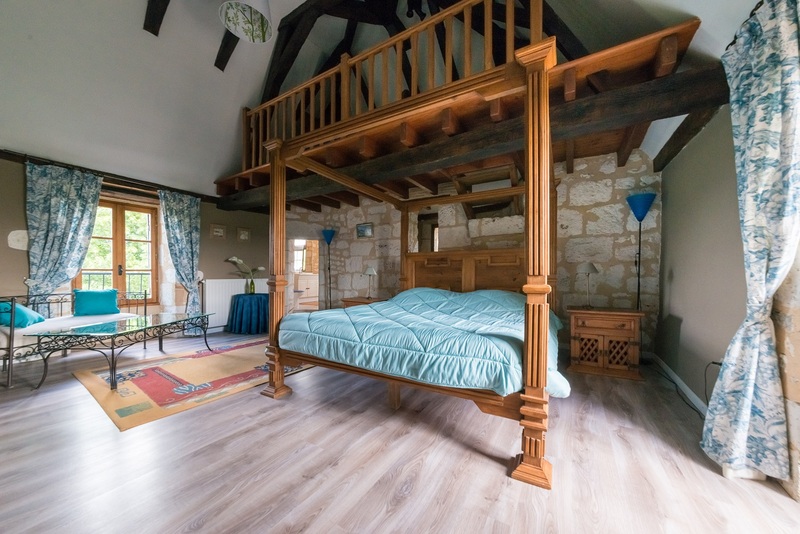 On the ground floor, furnished with a four-poster bed (1.80*2.00 m), a seat and in the adjoining tower a bathroom with a shower, washbasin and toilet. This room has its own entrance and terrace.